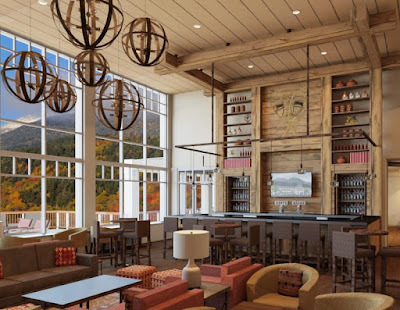 The design of the newest incarnation of The Glen House pays homage to the classic White Mountain hotels of the 1850’s, utilizing clapboards and painted trim in a style similar to its predecessors. The guestrooms have the simplicity of Shaker design while the expansive public spaces will have artwork embracing both the history of the Mt. Washington Auto Road and the four previous hotels. Many of the guestrooms will have balconies facing the 6,288 foot peak. The Glen House restaurant, The Notch Grille, will serve casual American family cuisine at breakfast, lunch and dinner. There will also be a bar and lounge, as well as an expansive outdoor dining area with a view of Mt. Washington. The hotel’s outdoor function areas will be ideal for hosting weddings and events. The Glen House will be dog-friendly and have a dedicated meeting space, a gym and an indoor swimming pool, with complimentary WiFi throughout the property. The three-story hotel will serve guests driving the famous Mt. Washington Auto Road and taking advantage of the four season activities at Great Glen Trails Outdoor Center, which offers walking, hiking, trail biking and fly fishing in summer, along with guided flat water and white water kayaking. Winter activities include Nordic skiing on 45 kilometers of classic and skate-groomed trails, snowshoeing, fat biking, snow tubing and winter tours up the mountain on the Mt. Washington SnowCoach. The fall foliage viewing in the White Mountains is among the best in New England. The hotel was designed and is being built primarily by New Hampshire firms. The architects are BMA Architectural Group of Amherst, Stibler Associates LLC of Manchester are the interior designers and Martini Northern of Portsmouth are the contractors. Subcontractors include Ray's Electric of Berlin, Granite State Plumbing and Heating of Weare, Yeaton Associates Inc. of Littleton and GB Carrier Corp of North Conway. Thomas Spaulding has been named the General Manager. The Glen House will be close to energy self-sufficient and carbon neutral, thanks to a geo-thermal system that will provide heating and cooling as well as two offsite energy-generating projects harnessing hydro and solar power. Located 30 minutes from North Conway, The Glen House is expected to open in mid-September 2018 and is currently accepting reservations. You can visit The Glen House website to learn more about the hotel and to make reservations.